Doug North Cook is in charge of the Bachelor of Arts in Immersive Media program at Chatham University. He has been working for the last 2 years, with help from a lot of people in higher education and in the XR insdustry, to develop what the first programs like this will look like. 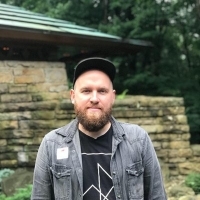 He also runs the Immersive Design Residency at the Fallingwater Institute. He develops virtual reality (VR) art experiences and games with a small team at Decoder. Doug's work combines his passion for VR/AR with his obsession with design thinking and theory.